Last Friday we hosted the first of a four-part web seminar series titled Modeling for Environmental Sustainability. This first session was about how you can use simple bathtub dynamics to understand climate change. In the session, Chris Soderquist demonstrates how you can use embeddable simulations to help raise awareness and understanding about climate change. 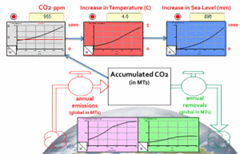 Using simple bathtub dynamics, the “C02 Dynamic Indicator” simulation lets anyone experiment with the current set of policy proposals for capping and reducing emissions. The live session was recorded and is now posted on our website, along with two embedded simulations that you can run online. All of the session materials are open source and we encourage you to link, embed and share them with others.